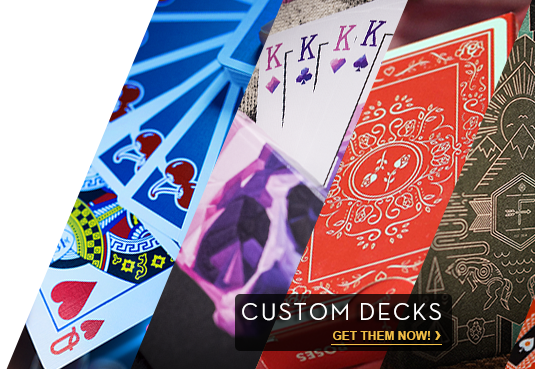 Show us YOUR best routines with the DMC Elite and Alpha marked decks! This could be your worldwide debut. Plus you could win free stuff! Even better, TV sensation DMC and creator Phill Smith will PERSONALLY unveil your routine on Murphy’s LIVE Facebook show on April 3rd at NOON, PST. SEND US your best routines using the DMC Elite or Alpha decks to social@murphysmagic.com no later than Friday, March 29th. Winners will be unveiled and tagged on Murphy’s LIVE Facebook show on April 3rd at NOON, PST. Watch and you could WIN FREE stuff! Not only will we be showcasing the BEST routines, we will be giving prizes away. Watch Murphy’s Facebook Live on April 3rd at NOON, PST.